Ice Clouds. High, whispy cirrus clouds are composed of ice crystals often formed from supercooled water or water vapor freezing on dust particles. Scientists in this research found that when the crystalline structure of dust is disturbed by pollution, dust is less likely to act as an ice seed. The fate of dust and how it affects clouds is important for climate understanding. Enlarge Image. Results: Wrapped in pollution, dust diverts from its usual course and steers clear of water. The result, found researchers at Pacific Northwest National Laboratory, closes one more gap in understanding how—and when—cloud ice crystals form. They found that dust, usually a primary catalyst encouraging ice formation, when modified by pollution from combustion becomes less attractive for water vapor to initiate ice crystals under certain conditions. The "aged" dust particles, poor at catalyzing ice crystals, significantly alter the cloud environment by decreasing the number and concentration of ice crystals and ice water content. 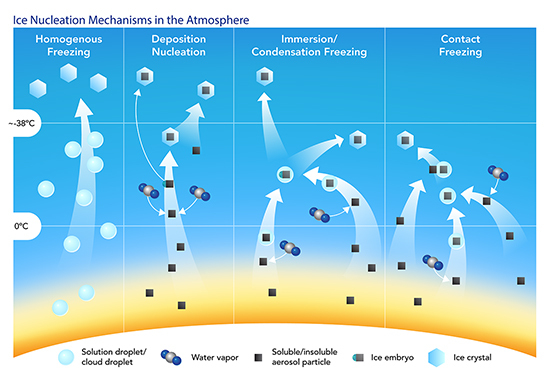 "Currently, atmospheric models do not include calculations on the ice nucleation properties of aged aerosol particles," said Dr. Gourihar Kulkarni, atmospheric scientist at PNNL and lead author of the study. "We found that aged particles lack the optimal crystalline structure to act as ice nuclei." Why It Matters: More than half the Earth's precipitation originates from ice in clouds. Scientists are working to understand all the ways an ice crystal is born, a process called ice nucleation. 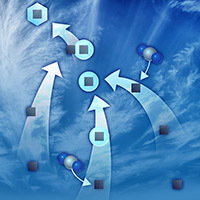 Representing this fundamental process in models will go a long way to reduce uncertainty in predicting climate change, specifically understanding aerosol-ice cloud interactions. The focus of the study was to understand the characteristics of dust particles which can attract water vapor and water droplets to form ice. Though its journey might last just a few days, dust plays a large role in what happens in clouds. Understanding what happens to the freshly emitted particles that are coated with human-caused pollution, such as acids, and how that changes a cloud's structure, was a focus of this study. Researchers are working to fill gaps in understanding this fundamental process, ultimately to better understand climate change. Methods: A research team led by PNNL scientists investigated the ice nucleating properties for different dust samples, from fresh to aged particles (those coated with acid) using the ice nucleation chamber located at PNNL's Atmospheric Measurements Laboratory (AML). They integrated the laboratory ice nucleation measurements into the Single-column version of the Community Atmosphere Model (S-CAM5) to understand the sensitivity in simulated cloud properties. They performed simulations to understand the influence of the coated dust particles on ice-containing clouds using observational data from the Atmospheric Radiation Measurement (ARM) Climate Research Facility's Southern Great Plains site. In parallel, the team analyzed the diffraction patterns of test dust samples to understand how the crystalline properties of dust were important for ice nucleation. For this analysis, they used the X-ray diffractometer at EMSL. Dust is a primary catalyst for ice formation in the atmosphere. Illustrated are the several ice nucleation mechanisms through which primary ice is formed, including those investigated in this research. Scientists found that when dust particles are modified by pollution, they are poor at catalyzing ice crystals and significantly alter the environment of the cloud by decreasing the number and concentration of ice crystals and ice water content. What's Next? The study confirmed that ice clouds are sensitive to the mixing state of dust particles. Next, research will investigate the implications of dust size and aging fraction at various temperatures and cloud life cycles (e.g., pre-activation) with the help of two ice nucleation chambers that are currently available at the AML. Additional research is underway to derive and test ice nucleation parameterizations in cloud models. The long-term goal is to provide a fundamental theory basis to represent the ice nucleation process in climate models. Sponsors: The work was supported by the U.S. Department of Energy (DOE) Office of Science, Office of Biological and Environmental Research (BER) as part of the Atmospheric System Research program. Additional support was provided by the U.S. DOE Community College Internship program. Facilities: The research was performed at the Atmospheric Measurement Laboratory, an atmospheric sciences laboratory located at PNNL. The research used observational data from the Atmospheric Radiation Measurements (ARM) Climate Research Facility, a DOE Office of Science User Facility sponsored by DOE's BER. The XRD analysis was performed using EMSL, a DOE Office of Science User Facility sponsored by BER and located at PNNL. Research Team: Gourihar Kulkarni, Kai Zhang, and Chun Zhao, PNNL; Cassandra Sanders, Washington State University; and Xiaohong Liu, University of Wyoming.